A coalition of Brooklyn elected officials and civic groups today gathered on the steps of City Hall in Manhattan today to launch the “Campaign to Reform Atlantic Yards,” an initiative to pass new legislation that would reform the governance of the Atlantic Yards project. The Campaign was launched in response to the continued lack of accountability, transparency and public involvement in the governance of the Atlantic Yards project. Modeled on the Hudson River Trust Act of 1998, the Atlantic Yards Governance Act (A11395) would address this by creating the “Atlantic Yards Development Trust” to oversee the project with a board of state and city appointed officials. The legislation also would create a “Stakeholders Council” comprised of local residents appointed by local elected officials that would advise the Trust and provide an opportunity for meaningful impact. The Trust would have the following four primary responsibilities: oversee the implementation of the design guidelines for the architecture of the project; coordinate the involvement of state and city agencies responsible for the environmental impact mitigations; coordinate the development of policy surrounding the project (including transportation concerns), and approve changes to the general project plan. Under the bill, the Atlantic Yards Development Trust would be governed by a board of 16 members. The governor would appoint eight members and the Speaker of the Assembly, Temporary President of the Senate and Mayor of New York would each appoint two members. One member would be appointed by the Borough President of the borough of Brooklyn and one non-voting member would be appointed by the Stakeholder Council. Said Assemblywoman Joan Millman in a statement, “Given the recent turnover at ESDC, having a clear and firm leadership structure responsible for the governance of the Atlantic Yards project will ensure that the project has proper oversight and, most importantly, meaningful community involvement.” Assembly members Brennan and Millman are co-sponsors of the Atlantic Yards Governance Act. 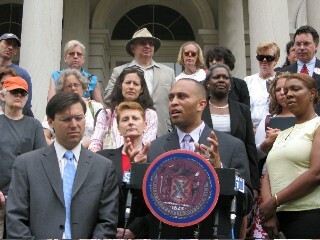 The bill would also create a “Stakeholder Council”, made of local residents appointed by local elected officials and representatives from Community Boards whose districts includes parts of the Atlantic Yards footprint, who would advise the Trust and provide an opportunity for meaningful community input into the decision-making for the project. “Nearly 6000 New Yorkers have written letters to the Governor calling for meaningful public involvement in this project, and so far, the State hasn’t responded.” said Gib Veconi, Chairman of the Prospect Heights Neighborhood Development Council, one of the BrooklynSpeaks sponsors, holding up copies of letters that have been sent to the Governor. “This legislation, when passed, will at last address the need for inclusive and accountable governance for Brooklyn’s largest ever development project”. In August 2007, the sponsors of BrooklynSpeaks issued a "roadmap" w for reform of the governance of Atlantic Yards titled Reforming the Governance of Atlantic Yards: A Roadmap. “I’ve been involved in Riverside South, on the Upper West Side on Manhattan. That project was begun 17 years ago and it’s only half-finished. We’ve been through four governors and three mayors, and the only glue of the project of the project has been the involvement of citizens – through a structure. We need this at Atlantic Yards,” said Kent Barwick, President of the Municipal Art Society.